I was going to spend some time today completing a post I had started weeks ago on Jack Zduriencik , but WordPress does not seem to have auto-saved it, and I didn’t want to start from scrach again. I will figure something else out later, becuase it is something I’d like to address. The Mariners are currently playing in Ahaheim with Hisashi Iwakuma on the bump for the Ms and Jered Weaver taking arm duty for the Angels. We have lost two of this three-game series, so my hopes are not high. Tomorrow we start a three-game series with Houston, and my hopes are even less high that anything positive can come out of that. I have reached the point where we might as well lose to help the Angels beat the Astros (David Friese just hit a solo dinger, and I am not currently a fan of anything coming out of Texas), but right now I’m kind of focusing on the end series next weekend, the post season, and the beginning (for me) of football season. I’m not going to lie, this year has been really difficult for me and blogging. There is literally nothing I can tell you that you can’t read elsewhere written by smarter people who know more about this team than I do. It’s hard to want to spend so much time with a team that has tanked the way the Mariners did this season – coming off of a good season last year and now sitting at .477 (a number that will change by the time this game is over). I bring my camera to games, but I don’t take as many photos as I used to, and I have even less desire to upload them here and talk about them; by the time I get home from a game, I need to go to bed, and by the time I wake up at 5 the next morning, deep apathy has sunk in, and I figure well, everyone else has already covered all of this anyway. All I can contribute to the discussion is how warm it was there, that I may have joked with other fans behind or in front of me, that I maybe tried some new food…everything else is done by other people who are paid on a daily basis to figure out how many ways there are to say that this team has been a disappointment. If I was paid, I’d be queen of the thesaurus. Alas. This season has not been without its perks. 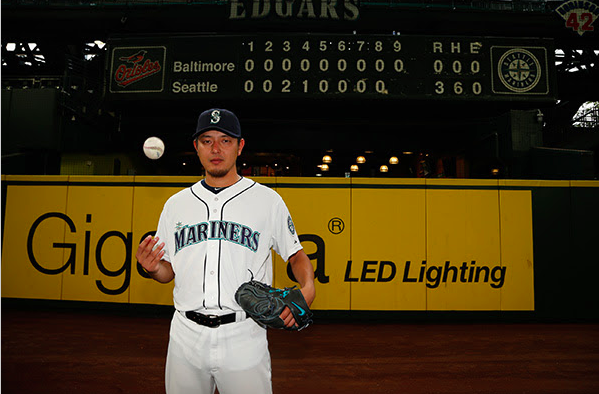 Our boy Hisashi Iwakuma threw his first career no-hitter against the Orioles, the Mariners fifth no-hitter. He was the first American League pitcher to throw such a game since Felix’s perfecto in 2012, and the second Japanese pitcher in MLB history to do it. I like to think that there might be a little space in Cooperstown for Iwakuma, a guy who has been pretty faithful to us when healthy. Maybe a game ball or a pair of shoes with a nice plaque somewhere, as you wind towards the Hall of Fame. Iwakuma is one of the guys I’ve liked since he first got here, which is rare; usually players need to prove themselves a lot more, but Kuma has come in strong out of the gate. His W-L records have always been heavy on the win side, and while he has had his injuries and fair share of hard times since he got here in 2012, he has remained a +WAR pitcher with a nice happy FIP of 3.87. He is a lot like Ichiro; very stoic and efficient, and almost always gets the job done as it is required of him. If I am reading BBR correctly, his contract is up this year, but I hope they figure out a way to keep him around longer. He has been very good for our team, and I feel like he could be an integral piece of a winning Mariners team, if that is to happen any time soon. At 34, he’s still throwing well. He’ll be a free agent next year. So now I turn my attention to the last series of the year next weekend, the playoffs, and Green Bay Packers football. The New York Mets and Kansas City Royals have already won their divisions. The Blue Jays, Cardinals, Pirates, and Cubs (THE CUBS!!!) have clinched playoff opportunities. The battle for every division other than the NL East is close with literally a week left to be decided. Of all of the teams above, I trend towards the Mets and the Cubs. All hope for Wild Card play from any of my other teams is already over. Baltimore is currently 5.5 games in back of the WC, and Detroit is so far in the basement they need a flashlight. Arizona was middling this year, and will likely finish the season just below .500. The Phillies have spent all year struggling through everything thrown at them, and will likely have the first pick in the draft next year, competing only with the Atlanta Braves for that honor. So because I’m not planning on concerning myself with the Wild Card ins and outs any time soon, now I wait to see what is going to happen; which is the sort of a method of watching sports that I prefer in general anyway. It’s an interesting group that will make it out of the regular season, maybe one of the most interesting for a few years, and I do love a surprise. Meanwhile, Fan Appreciation Night is happening at Safeco this coming Friday, and I plan to be there, and then the traditional last game of the season. And then plans for the 2016 season start and we will see what it is that the Mariners front office now thinks it can do with the ashes of 2015. Good blog about an uninspiring team. Not your fault. The boys need to up their game a lot.